We can offer you a better way to buy flowers and bouquets. Unlike most other florists we grow most of what we sell. We are proud to be growers of exceptionally high quality flowers specialising in roses. Buying direct from Dawnacres guarantees a fresh product at competitive prices. We offer a full range of floristry services.As we live on the property we can often offer a 7 day service. At Dawnacres we have 2Ha of land with 750 square meters under plastic where we grow roses, lillies, lisianthis and sweet smelling stock. Our spare land is used to grow christmas trees, graze three cattle beasts and six sheep. Chris and Lorraine Burns live at Dawnacres and this is why we can often offer a 7 day floristry service. Lorraine works off the property in Hastings during the day and is a competent florist who will usually make up your weekend orders. She looks forward to when she can retire from her day job and focus on wedding work. Chris is a high school teacher at Havelock North High School specialising in teaching sciences and biology. He bought Dawnacres about 20 years ago as a place to graze ponies and today he maintains the flower crops and Christmas trees. His skills at making up bouquets enables him to be a florist as required, but this is a job he usually calls Lorraine to do. 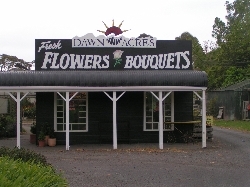 As one of the leading florists in Hawkes Bay, Dawnacres Florist specialises in delivering bouquets beautifully gift-wrapped in colourful, frilled crepe paper tied with ribbons. We also deliver floral arrangements in glass, vases and vox boxes which are ideal for hospitals or people who may be short of vases or space. We cater for weddings, funerals, and if fact we can offer a full floristry service for any occasion. At Dawnacres we are in the unique position of growing many of the flowers we use in our arrangements and are usually be very generous with the number of flowers we use. To increase the variety of flowers available we are fortunate to be able to by from a local flower grower and wholesaler. Buying from Dawnacres guarantees you a quality product at the most competitive price. 99% of our customer reviews rate us as a five star florist. Dawnacres is located on Havelock Road which is just a few minutes drive from Hastings, Havelock North and Napier. The local hospital for the area is 12 minutes drive away.We are able to offer delivery to most of Hawkes Bay as the rural areas are serviced by a daily mail car. As Lorraine and I live on the property we are often able to offer a 7 day floristry and delivery service. Beautiful,fresh product and very efficient service. Always go the extra mile with added sparkle or a butterfly and very accommodating to any colour or flower requests. Highly recommend. The flowers I ordered for my friend looked beautiful on the picture she sent me, and they were delivered so quickly from the time of my ordering. Very impressed. Thank you. Very easy process and flowers were great. Many thanks. Beautiful, simple, red rose, was loved by my husband, on Valentine's Day. Thank you Dawnacres Florist. My sister said the flowers she received were absolutely beautiful, not padded out with greenery. Delivered on time. Cannot fault Dawnacres Florist. Really good. Thank you. The flowers were beautiful thanks. Flowers were much smaller bunch than expected for the price paid, not much like the photo example provided. Top service especially on Xmas eve! Very happy and would recommend to others! Beautiful flowers so glad to get them ordered and to our friend in the same day. My sister was delighted with the flowers I sent from Dawnacres and I shall use this florist again. Excellent very pleased with order highly recommend. Delivered same day, despite me being a little late in ordering. Thank you! Awesome service. Lovely ladies. Arrived when I wanted them too and looked fabulous. Thank you very very much!!! It would be good (a) to advise when flowers delivered and (b) send a picture of them. Very easy to navigate through online order process and flowers delivered without any issues. Excellent service. .y friend was very pleased with her flowers, and as delighted they continued to bloom. Beautiful bouquet delivered same day as promised. Flowers arrived within 3 1/2 hours of ordering and looked just like the picture online. Very efficient service. There was a slight miscommunication in delivery address but they rectified it and delivered. They were great. My friend was very happy with her birthday flowers. The booking process was so quick and easy. Thank you. The flowers my husband ordered for my birthday were just beautiful. Prompt delivery and amazing flowers! Great flowers every time- never been disappointed. Thank you for the wonderful job you do. Really good service from my chosen florist. Although they were really appreciated by my daughter in law I haven&rsquo;t seen a photo of the flowers as yet. The recipients loved the flowers, saying they were gorgeous. Thank you! Great, prompt service and delivery, and (Mum says) the flowers are beautiful! Thanks. I bought the Fall Bouquet as advertised online. I was particularly taken by the autumn lillies and leaves as illustrated. I thought the bouquet I received looked like a generic product which bore little resemblance to the illustration - certainly not as large as illustrated - despite buying the Deluxe option. There was no gift bag as specified, just bare stems. When asked about a suitable container, the shop provided a wine carton stuffed with newspaper. Consequently for me an overpriced and not impressive gift as planned. <br/> <br/>I also requested that I collect the bouquet from the shop I ordered through (Dawnacres) and had difficulty communicating this - the website doesn't provide that option, and despite specifying that in the Special requests box, it required an exchange of emails to get the point across. <br/> <br/>I will not be using this service, nor the associated florist again. Got pictures of the bouquet from the recipients and the bouquet reflected what the order said it would be like, so excellent thank you. <br/>BUT - the website said delivery on the same day if ordered by 2pm. We got the order in at 2pm but got an email saying it would be the next day. It didn't matter that the delivery was the next day but if your website says 'the same day' then that's what it should be or otherwise don't advertise it that way. Thanks. Fantastic service! Flowers were beautiful and delivered as per the delivery instructions! Thank you so much! This is the second time I have ordered flowers from Australia to be delivered in Hastings New Zealand and I am very pleased with both times. The Flowers were beautiful and delivered on time. Thank you! I haven&rsquo;t seen the flowers but my mum said they were great so thanks! Flowers arrived looking not the least bit like the picture I choose, the colours arrangement and style didn&rsquo;t hold the slightest resemblance. The bunch that was received wasn&rsquo;t even nice we are very disappointed that we spent our money and for a gift for someone we sadly wish we had chosen a different florist i really don&rsquo;t like to complain but feel when you don&rsquo;t get what you pay for truthful feedback needs to be given. I was very disappointed. What I ordered was not the selection that was delivered and I would not have known if I did not receive a photo from the recipient of the flowers. When I queried why the correct flowers were not sent I go a prompt email agreeing it wasn't good enough as the selected flowers were in stock however there was no mention of what could be done to rectify the issue. I will not be using this florist again. Bouquet was beautiful, was a short notice order for mother?? ?s day and was delivered at a great time. Unfortunate it was delivered to the wrong address, lucky for honest neighbours. Overall though, very happy. beautiful flowers and reasonable priced. This is the third time I have used them and it will not be the last! I was able to change the date of my delivery through email and they were very very cordial to me. The recipient said the courier was very friendly and even redirected the delivery to the building on grounds where she was working. I can not rate them highly enough! Very reliable and fast when I requested quick delivery. Recipient was very very pleased with the flowers. I requested a photo &amp; a morning delivery &amp; they delivered on both requests. Good service letting me know when delivered with a photo . Same day delivery, although instructions were left if the recipient was not home leave by the door, the deliverer left note on the garage door prompting flowers were by the other door which was fantastic thinking :-) Top marks! Good selection, fast and efficient website. This makes things easier to order from overseas (Australia) when one has had a very sad loss. The service is almost immediate! The only comment would be regarding the size of the bouquets. It&rsquo;s very difficult to judge size from the photos so perhaps a bit more of an idea rather than just selecting small, med, large would be helpful, because that would be the only slightly disappointing thing I found. Very speedy and I heard the flowers were beautiful, also saw the picture of course. Thank you! BEAUTIFUL flowers, much bigger than I expected. I ordered and they delivered the same day. Very easy to use, clear website, and great service and quality. Fantastic communication and my daughter was absolutely stoked with the arrangement that I sent her - she sent me a photo and it was what I had chosen. It was even delivered within the requested timeframe. Strongly recommend. I was more than pleased and so was she! The arrangement was, of course, beautiful but even more, on what must be the busiest day of the year for florist, Valentine's Day, the requested AM delivery was made as her work day began so all her coworkers got to see it! Thumbs up, A+ and 5 stars! Could not be happier! Will definitely use Dawnacres again! Beautiful flowers and fantastic service, thank you. Great flowers arrived on time. Ordered on that day and received on that same day! Came in perfect time ! I asked for flowers to be delivered same day, and this was done. My friends report the flowers are lovely. Great website, easy to use. Beautiful quality and large variety to choose from. I ordered in the morning and they arrived an hour later. The recipient was very happy and so am I to have this fantastic service. I was sent a photo which I requested and the flowers were exactly what I paid for. They were beautiful. Highly recommended and will use again. Excellent. Email confirmation of delivery and I understand from the recipient that the "Christmas flowers" are very elegant which is exactly what I hoped I had ordered. Gorgeous flowers, just what I ordered. Such fast delivery and the flowers were true to the photo. Such great service, thank you. Looks lovely and a quick delivery too. Great service. Nice to have received an email to confirm flowers had been delivered along with a photo. Well done. Beautiful flowers for mum. Delivered on time. Perfecto! Great service, I particularly appreciated being emailed a photo of the flowers when they were delivered. The flowers were gorgeous, we even received a picture from the florist of the arrangement that was delivered. My sister loved them, thank you very much! Beautiful presentation of flowers and the perfect flowers chosen for the occasion. Very happy with the service. Good to know they even left a little note on the garage door to let mum know that there was flowers there. I will definitely order from them again. Thank you! The flowers and the arrangement are beautiful, my Gran was thrilled! Just what I ordered. Thanks for the photo. My daughter in law was very pleased with them. Amazing flowers and amazing service. Will be a customer for life! I ordered a bouquet for my sister who had just come out of hospital. It was 2.30pm and I thought that it would not be delivered until the next day. A couple of hours later she rang to say how thrilled she was with the fabulous flowers.. The sent me a photo of them and they were just lovely. So happy thank you! Great honest service, thank you very much will certainly use you in the future. Flowers beautiful. Delivery excellent.. Service from order to delivery excellent. Thank you. Service was spot on, Roses were loved. Got a photo of the flowers before they were delivered. Happy with the bunch and how they looked. Received confirmation when they were delivered. Dawnacres were very easy to deal with and accomdating with requests for flower additions. I wanted alttle white stock in my order because I love the perfume. My daughter was rapted with the bouquet As it was beautiful. Awesome job !!. Everything was perfect. The only thing that might have been even better was if it had been possible to organise a delivery on a Sunday. But as things are I am very satisfied! My friends were delighted with the flowers they received, extremely prompt delivery thank you. Highly recommended. The flowers were beautiful and the Courier even rang me to say they had been delivered - will def use Dawnacres again. My mother loved the flowers and they arrived the same day - great service! Great, speedy service and the recipient loved her flowers. Thanks so much. A beautiful arrangement , delivered on time as promised. My parents were thrilled with what was supplied. Thankyou. Would be good if you receive a notification that the flowers have been delivered and even a photo of what was delivered. Feedback from recipient was really good. The flowers were described as &quot; absolutely beautiful &quot; I was delighted with the selection of flowers which included white orchids. Very competitive prices as well was an added bonus ! Flowers looked lovely and delivered on time. Good. idea to send picture of flowers sent with confirmation email. Flowers were exactly what was expected and delivered at the time requested. Thanks! Flowers were lovely but for $73.00 it wasn't good value for money. My Mum was very happy with the flowers - exactly as I had ordered. thanks for the picture of the flowers and email to confirm delivery. Great service and person recieving them have great compliments also. Flowers we requested were sent.All instructions followed and delievered on day that we requested.Very impressed. The flowers were delivered so promptly, within a few hours. The flowers made my friend so happy so in my mind that is the best result we could ask for! The flowers look lovely & I am sure Barbara would be thrilled with them. I have not spoken to her as yet. Thank you for your service. Cheers, Gay. Thank you for making that beautiful bouquet. Received, created, delivered and received in just over 2 hours. Very impressed!!! And it was such a beautiful selection of flowers. Not to sure where the problem was, but sent an email after i placed my order to change delivery address. received no reply and the flowers arrived at the original address. Received a delivered email at 8:30pm when the web page stated that a Text would be sent. Nice flowers and delivered timely. Very prompt service and recipient of flowers very pleased. Great choice, efficient service. Thank you. I submitted an order to Dawnacres Florist via Direct2Florist from Ireland. I had requested a sympathy floral bouquet. The flowers arrived at the address I provided on time and the recipient was delighted with them. The arrangement was really generous in size and really colourful and bright as we had wanted. Thanks to all at Dawnacres for supplying such a good service. Ordered via Internet. Flowers delivered were very similar to what I ordered. The flowers are beautiful. I thank you very much for doing such a great job. I was very impressed with how efficient you were and how easy the website is to use. Many thanks I will continue to use you only from now on, it's do nice to find someone so easy to deal with. Well done,keep up the good work. Excellent and prompt service. Beautiful bouquet. Thank you! Beautiful arrangement delivered in good time. Ordering was simple with no fuss. Thank you so much! Apparently the flowers you sent were absolutely beautiful and that was from the receipints husband. So thank you very much. Flowers were delivered on time and my Aunt was extremely happy with them. Dawnacres answered my email query promptly and were happy to take an order from Scotland. I was told from the recipient that the flowers were delivered on time and were gorgeous! Only ordered the flowers at 1.00pm and they were delivered by 2.00pm the same day - wow wonderful service yet again Dawnacres. Thank you. Fantastic quality. Flowers were delivered on the day I ordered... with a very happy girl having received them.. thank you for your great work. Didn't see the flowers &#55357;&#56464; sent to my mother but hoping all good &#55357;&#56397;. Delivered in good time, very pleased with flowers. The photo of sample flowers is excellent so choosing is easy &amp; the confirmation delivery email is reassuring. Have purchased twice this week &amp; will definitively use again when I need flowers to be sent. Beautiful flowers were delivered to the delight of my friend. Fast efficient service. Recipients were very happy with the flowers. Thanks. The flowers delivered to my mum were beautiful! She loved them. Thanks so much, will definitely recommend. Absolutely incredible, fast and super effective, price was great and the flowers were gorgeous! Thank you!!! Flowers were good, communication was good, but flowers were delivered 2 days early. Certainly not the end of the world, and no harm done as such, but if the timing had been critical, it would've been a show-stopper. Otherwise, happy with their service and product. Even though they delivered to the wrong address and my friend was concerned whether the flowers would last they gave her a guarantee that if she had problems they would replace them for her. They also gave her suggestions on how to prevent wilting from happening. She was very happy both with flowers and advice given. Its my second time with them and they are awesome.. Thumbs Up! Beautiful flowers, really refresh and really brightened recipients day. Just what was requested. A cheer me up bunch of flowers. You nailed it. Thank you. Thank you very much for guys help my girlfriend loved her flower and had a tear when she got to work and found them , she said they were perfect. Ordered for delivery in Napier so chose this florist as wanted to be sure flowers were fresh as possible. My daughter was delighted with her surprise bunch of beautiful gerberas waiting on her doorstep when she came home. She said they were very special and so I was glad I decided to send them. One slight dissapointment for me though was I thought there would be more blooms in the bouquet. I chose the middle option for $70 and got 10 flowers plus greenery. Flowers looked lovely though and lasted a week. Awesome service. Beautiful arrangement. Super fast delivery. My sister said the flowers are gorgeous.Many thanks. As always, service and flowers impeccable. I always use. Promptly delivered and a gorgeous bouquet of flowers. Very pleased with service. I was initially disappointed that I wasn't told the flowers had been delivered, but then I found a lovely message with photo that had gone into my junk folder. Wonderful service and a lovely bunch of flowers too - thank you very much. Liked the touch of sending me an email with photo. Excellent service I received an email to say the flowers were delivered and two minutes later my daughter phoned to thank me for the stunning roses! Thank you a whole 'bunch' ! Excellent service and flower arrangement met expectations. Hope to see your services in future. Thank you. Great service,good to be able to see what I had purchased.Recommend. Flowers were excellent. Disappointed with response to Special Request re delivery, but may have been courier inflexibility. Receiving a photo of flowers sent was special touch that I was not expecting. always great service and value for money. Thanks guys! The flowers were not the same as I chosen online. my family I sent the flowers for were very happy with what the received, said they were lovely and colourful loved them. That's all that mattered in the end . Since I'm in Australia and couldn't be there for them . So thank you from my heart . Will use this florish, again"
Loved the flowers, thank you! Flowers were beautiful and delivered when they were required. Service was much appreciated. I would have appreciated an email confirmation that order had been sent but I heard the flowers were beautiful. feedback was very good and I loved the picture included in message as it gave me a good idea of what was sent. Flowers delivered on time, of good quality and well received. thank you. Fantastic. I really appreciated a photo of the flowers being sent along with confirmation of their delivery. They were very well received! Thanks! From an English customer. Thank you.I was very impressed with the service, especially the 2nd delivery of flowers when the first delivery was a little too early. My sister was well pleased. Thank you so much. Flowers were great - not sure who was supposed to email me a photo of what was delivered but I never got one. Recipient said they were georgeous. Beautiful flowers and amazingly prompt delivery. Would happily use this service again. Flowers looked nice on the email sent to me but different from the original sample I ordered from the web site. Thanks. Flowers were delivered within 2 hours of order being placed and recipient loved them. Requested morning delivery but flowers did not arrive till 3pm. However, appreciated that it was a Sunday delivery. Flowers were lovely. Amazing, the flowers were beautiful and were more amazing in person than in the picture on the website. They were reasonably priced as well. I'm very impressed and will be using them again. Unfortunately I have not seen the flowers so cannot comment, only that the recipents were very happy with them. I can't give you an excellent because I have never seen any of the flowers I have ordered but the recipients have appreciated them. Recipients were thrilled with their flowers, and commented on how fresh the bouquet looked. Lots of buds will ensure that they last a long time. I heard from the recipient that the flowers are gorgeous. Thank you. Very quick personal service, beautiful Flowers and presentation. Flowers and chocs arrived 12000 miles away on the appointed day within a few hours of ordering. Thank you so much. Flowers apparently were gorgeous. I always appreciate the photo of what has been delivered. They looked beautiful as always. Heard from sister-in-law who was thrilled with the flowers. I asked for bright colours and she received red and yellow, great! Expectation was very well met. Thank you. Thanks for accommodating a change in delivery date. The flowers were well-received and really brightened the day of the recipient. They were on time and Mum was really happy with the flowers - thank you so much. The recipient of the flowers comfirmed that my order was as I requested. The whole process was smooth and efficient. Dawnacres is a delightful florist to deal with. When there was an issue with the actual flowers they had available for the arrangement advertised I got a quick phone call and alternatives were discussed with a great result. The service is excellent, flowers were beautiful and the recipient was moved to tears. Highly recommended. My mother was very impressed with the flowers. The flowers were wonderful and the service incredibly quick. I really appreciated that the confirmation of delivery included 2 photos of the arrangement. A very nice touch. As always, beautiful flowers, thank you. Good communication to ensure delivery. Product was of excellent quality. Will recommend to others. I think you had some reasonable prices which is why I was happy to chose you. Thank you so much. The photographs are a wonderful addition to this service that mean I do not have to wonder what I had chosen. The recipient was thrilled at how beautiful they were. This is my second time with dawnacres florist, and yet again they have exceeded my expectations. Amazing arrangements for less cost than elsewhere, and very efficient. I'll be back! Thank you dawnacres! Great stuff - my Nan was very happy! Without a doubt Dawnacres has been the best florist I have used and will always order from here again. My sister was absolutely thrilled with the flowers and they were delivered the next day after ordering. The only very slight niggle was they said they would send me a picture of them as I'm in England & my sister is in New Zealand! Other than that an excellent service. Thank you. I am very disappointed in the flowers that were delivered they weren't a bouquet of long stem dozen pink roses that I thought I was getting . There were 8 roses and was a flat lay with mostly ferns and wilted daphne. Fantastic service, the flowers were beautiful! Delivered exactly as requested and the recipient was very pleased with the Florist's selection. We didn't see the flowers ourselves but my mother-in-law was delighted and specifically expressed her love of the colours used. Flowers were also delivered on day of order which was greatly appreciated. Recipient said they were the most beautiful flowers she had ever seen. Money well spent in my opinion & will buy from again. Thanks! Actual size of basket was much larger than shown on website. Flowers were lovely. Thank you heard from family flowers were lovely. Will definitely use again. Easy web, very quick delivery, and the photo I get is really great. Very thoughtful. Good old fashion service, thank you thank you. I'm very disappointed with the flowers sent to my parents for their wedding anniversary. The basket I selected was mostly pale lemon coloured carnations, smaller white flowers, with my mother's favourite yellow roses in a delicate and graceful arrangement. The photo of the flowers sent shows a chunky arrangement dominated by large yellow daisy-type flowers, some of which have dark centres. It isn't even the same type of basket. I'm shocked. Thanks. The photo of the floral basket sent for my order was a lovele touch. Very easy process to order, good choice of flowers, I liked the options of different occasions which helped when ordering from the UK. Thanks. Easy and simple to order,and super quick delivery!excellent!